LOS ANGELES - On October 3, 2012, an unprecedented gathering of music stars and friends joined together to celebrate the life and music of Levon Helm at the Izod Center in East Rutherford, New Jersey. "Love for Levon" featured performances by Roger Waters, John Mayer, My Morning Jacket, Gregg Allman, Ray LaMontagne, Dierks Bentley, Joe Walsh, Eric Church, Grace Potter, Garth Hudson of The Band, Marc Cohn, Jakob Dylan, Mike Gordon, Warren Haynes, John Hiatt, Bruce Hornsby, Jorma Kaukonen, The Levon Helm Band, John Prine, Robert Randolph, Mavis Staples and Lucinda Williams throughout the concert. This incredible tribute is available now as Love for Levon in DVD, Blu-Ray, CD and digital audio and video formats. GRAMMY Award-winners Larry Campbell and Don Was served as co-musical directors and led the all-star band at the concert. Larry was Levon's musical director during the last several years of his life. The event was produced by Keith Wortman, whose most recent projects include "We Walk the Line: A Celebration of the Music of Johnny Cash" and "Press On," a film about musician Robert Randolph, with the support of the Helm Family and Levon Helm Productions. 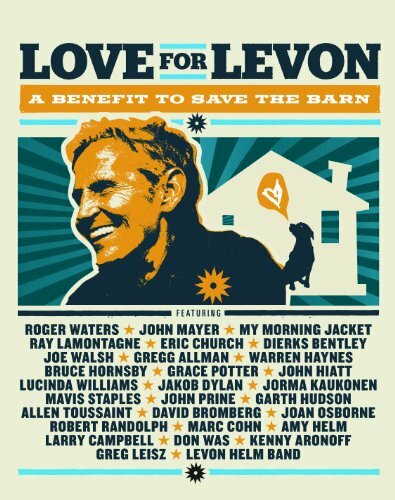 Net proceeds from the benefit event went to help support the lasting legacy of Levon Helm by assisting his estate keep ownership of his home, barn and studio, and to continue The Midnight Ramble Sessions. One at a time, or sometimes in pairs, music royalty took turns in the spotlight over the course of the evening, performing songs associated with Levon Helm and the Band, including "Up on Cripple Creek," "The Shape I'm In," "Life Is a Carnival," "Ophelia," "The Weight," "Rag Mama Rag," "Anna Lee," and "The Night They Drove Old Dixie Down." The 27-song DVD set includes performances by Warren Haynes, Gregg Allman, Roger Waters, My Morning Jacket, Joe Walsh, Robert Randolph, Eric Church, Dierks Bentley, Jakob Dylan, Lucinda Williams, Grace Potter, John Mayer, John Hiatt, Mavis Staples, Bruce Hornsby, John Prine, Garth Hudson, Joan Osborne, Marc Cohn, Jorma Kaukonen, David Bromberg, Amy Helm, Rami Jaffee of the Wallflowers, and Mike Gordon of Phish who all join together for a powerful rendition of "The Weight" at the close of the show. All DVD and Blu-ray sets will include special bonus material with almost two hours of in-depth artist interviews and behind-the-scenes footage. With a career that spanned over five decades, Levon Helm was an inspiration to musicians around the world with his deep respect, joy and love for music. Whether he was hitting the Arkansas 4-H Club circuit as a child, performing with Bob Dylan, garnering success with The Band and nurturing a successful solo career that included multiple GRAMMY Award wins, Levon was always a passionate performer who captivated audiences with an unmistakable voice and rhythmic power all his own. His Levon Helm Studio hosted musicians across multiple genres and his creation of The Midnight Ramble Sessions, a series of live performances at his studio, has seen performances from the likes of Elvis Costello, Kris Kristofferson, The Black Crowes and My Morning Jacket, to name just a few.